Barquisimeto, Venezuela.- Bucaneros de La Guaira's general management kept improving the roster to participate in Group C of the 2017 edition of Liga de las Americas FIBA, by adding Venezuelan PF-C Jose Juan Bravo (202-C-86, agency: Pro Sports), current player of Tinguiririca San Fernando in Chile. 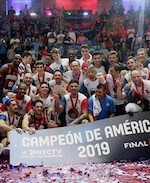 Bravo, a former player of Venezuela's Senior National Team that plays for Panteras de Miranda in LPB, is a 30 year-old player (2.02m) with experience in leagues of Mexico, Colombia, Uruguay and Chile. Meanwhile, recently signed player Marcus Hall (185-G-85, college: Colorado), a PG with experience in the Turkish league last season, will not be able to play for the team in Argentina against San Lorenzo (Argentina), Capitantes de Arecibo (Puerto Rico) and Hebraica Macabi (Uruguay), due to an undisclosed injury, according to a team report and a tweet in its official Twitter account. That means that the team that will play from February 3rd till the 5th will include players Jose Juan Bravo, Carlos Cedeno (193-PG-85, college: Frank Phillips JC), Jesus Centeno (190-G-85), Emiro Hernandez (94), John Cox (194-G-81, college: USF, agency: Pensack Sports), Donta Smith (201-SF-83, college: SE Illinois JC), Eduardo Torres (195-F-81), Tulio Cobos (197-F-86, college: Northeastern St.), Jhon Romero (199-F-85) and foreign players Jordan Hamilton (201-G/F-90, college: Texas) and Kristoffer Lang (211-C-79, college: N.Carolina). There's still no info on the possibility of a new foreign player replacing Hall in the roster in time for the games. Bravo will join the team in Argentina on Monday.